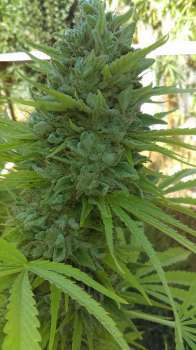 Here you can find a strain description about Glue Cookies and also some user-based reviews and infos directly from the SeedFinder (if available). You can also find the offers and auctions here if Glue Cookies cannabis seeds are on stock at MyCannapot right now. In our quest for high powered indica dominant hybrids for 2017, we came up with Glue Cookies, a new high THC strain we created using a GG #4 female from my friend Brian and a Girl Scout Cookies male. This is an F2, so there will be a few phenotypes. There are three very prominent phenos, which are all very similar in appearance with fat frosty buds, but the aromas are different. Pheno 1 has a fruity-gas smell. Pheno 2 has a strong glue smell and Pheno 3 doesn't have much of an aroma at all. We expect very high THC levels above 30%. She is a big yielder, as well as being very potent. The smell is the typical glue aroma that you smell through the bag. Big, very dense and very frosty nugs makes this a definite keeper strain! Glue Cookies is great for pain relief, insomnia, gastrointestinal issues, AIDS, stress, and ADD. Also good for PTSD. Flowering time: 60-65 days. Buy Glue Cookies now at MyCannapot!